AMSOIL's #1 best selling product! Great Price ~ Best Seller for over 20 years! Drums in 30, 55 and 275 gallon. Look up your vehicle's suggested lubricants, filters, capacities, wipers, transmission and drivetrain fluids. 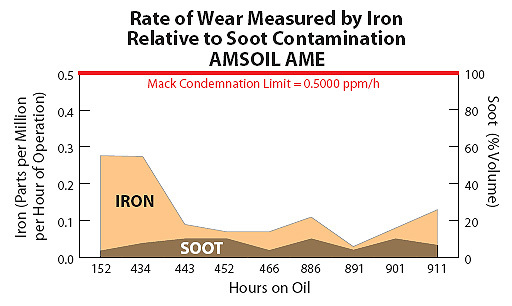 Print/save AMSOIL color data sheet on AMO 15W40 Diesel/Marine oil. AMSOIL Synthetic Heavy Duty Diesel & Marine Motor Oil can extend drain intervals far beyond those recommended for conventional petroleum oils. Its unique synthetic formulation and long-drain additive system deliver maximum engine protection, cleanliness and performance over extended drain intervals, reducing vehicle maintenance and waste oil disposal costs. Recommended interval guidelines are found below but using oil analysis many light duty diesel trucks go beyond 20,000 and over the road trucks do indeed go three times longer than the OEM interval. AMSOIL Diesel & Marine Motor Oil has lower volatility (evaporation) than conventional petroleum oils. Because less oil vapor passes into the combustion chamber, oil consumption and emissions are reduced. Lower volatility helps AMSOIL 15W-40 Diesel Oil retain its viscosity after high-temperature service for excellent fuel economy and continued dependable protection. Our Bypass Oil Filtration Kits add to the total capacity of oil which also allows the additive package life to be extended. Filter changes at the OEM intervals further extend the drain intervals per a oil analysis program. The time and money saved using AMSOIL AME, our bypass filtration kits and oil analysis is significant for the commercial trucking firm. Oil Analyzers Inc. (1-800-579-0580) is a division of AMSOIL that provides cost-effective, quality oil analysis services. We offer special oil analysis pricing with drum purchases. 5W30 Heavy Duty 100% Synthetic Diesel - Created as a more efficient version of the above 15W40. Our best oil and the top tier choice for any Pre-2007 HD and Lt. Duty Diesel. Best seller for Ford 6.0! All Climate. 5W40 & 15W40 CJ-4 Diesel - CJ4 - Latest 100% Synthetic Chemistry - designed to deal with fuel dillution issues and still hold viscosity. (15W40 version also availiable). Lasts 3X longer in 2006 and earlier diesels and OTR trucks. Exceptional fuel saings and temperature control in 18 wheelers. 10W30 Synthetic Diesel - Designed for fleets wanting one oil for all their vehicles and farm equipment - great for gasoline engines too. 15W40 Synthetic Diesel OE - CJ4 - AMSOIL's New low cost line for Diesel trucks which oil must be changed at OEM drain intervals. For the customer not interested in extended drains, this product is priced to beat all others. Diesel Fuel Additive - Best fuel additive on the market as it performs four tasks. Diesel Fuel Additivee w/ Cold Flow - Same as above but prevents gelling/clouding. Cetane Boost Additive - More complete combustion under load or cold weather. Instant fuel savings. Diesel Recovery - Instantly thaws gelled diesel fuel. Outstanding diesel engine protection. AMSOIL Synthetic Heavy-Duty Diesel and Marine Motor Oil's (AME) specifically blended long life formulation resists oxidation and thermal breakdown. Outstanding lubricity provides unmatched wear protection and maximum fuel efficiency. Contains performance additives for acid and soot control which are especially harmful in new EGR systems. Extended drain capabilities reduce downtime and motor oil expenses. Designed to deliver 1,000,000 miles in over the road trucks before engine overhaul. USING NEWER CJ4 in my Pre 2007 Diesel? If your primary engine specification calls for a CI4+ oil (or CI4) you generally are ok using (the newer) CJ4 as it is backwards compatible but it does this by different technology and on the shelf brands do have their limitations!! Know that only AMSOIL's CJ4 will protect naturally without having to add additional additives which talk away from the lubrication and anti-wear properties. But in our opinion, you are much better off selecting a oil which ends in CI4+ or CI4 because of the detergent packages, robust anti-wear packages known as ZDDP and the latest naturally detergent and multi viscosity base stocks. For the above matter, this is why AMSOIL has grown in sales reciently due to the fact that customers know about the trouble with most CJ4 oils and know that at the chain auto parts stores it's impossible to get the right oil for their pre 2007 trucks and cars. Vehicles without the diesel particulate filter exhaust system can get the right product from AMSOIL and it saves them money because it lasts longer, saves fuel and the vehicle can survive severe service longer. AMSOIL AME is one product you can use successfully and with premium performance in older trucks and service equipment. Diesel engine emissions have been an ongoing environmental concern for the past few decades, and the United States, Europe and Japan have responded to demands to reduce harmful particulates and nitrogen oxides (NOx). In the U.S., particulate and NOx levels were first regulated in 1988, with regulations becoming increasingly stringent through the years. In fact, 1988 standards set NOx and particulate levels at 14.4 g/kWhr (grams/kilowatts – hour) and 0.8 g/kW-hr respectively, while 2010 standards have been set at 0.27 g/kW-hr and 0.013 g/kW-hr respectively. By 2010, diesel engines will be considered “clean,” but getting there will require sulfur-free fuel, improved in-cylinder combustion, exhaust after-treatment, vehicle design changes and diesel oils that are compatible with after-treatment systems. In order to meet 2007 particulate standards, exhaust after-treatment devices such as particulate filters (DPF’s) and continuously regenerative traps (CRT’s) will be incorporated into diesel engines, creating new challenges for diesel oils. AMSOIL Synthetic Diesel Oils are ahead of the curve and ready to meet the challenges of tomorrow. AMSOIL Synthetic Diesel Oils surpass the most stringent modern diesel oil specifications, including CI-4 PLUS and EO-N Premium Plus 03. Formulated with top-of-the-line synthetic base stocks and advanced additive packages, AMSOIL Synthetic Diesel Oils effectively control the increased soot and acid levels associated with EGR units, while remaining shear stable at high temperatures, avoiding the damaging sludge and deposit build-up that contribute to decreased fuel efficiency, corrosion and accelerated engine wear. The drain intervals of AMSOIL diesel oils may be extended by oil analysis in EGR-equipped engines. Join us as a dealer and get your own high ranking page such as this one for our dealer in Chicago, IL or San Diego, CA. Call 1-800-579-0580 to order or for price.